The Dodgers finally snapped their infuriating six-game losing streak on Sunday afternoon with a commanding 7-1 victory over the Milwaukee Brewers in the series finale at Dodger Stadium. Ross Stripling gave the Dodgers exactly what they so desperately needed. He provided them a strong starting pitching performance. Stripling was crisp, clean and efficient, tossing eight innings of one-run ball to earn the win. Meanwhile the Dodger bats gave Strip a nice cushion, scoring seven runs and hitting two home runs to back Stripling on a sunny afternoon at Chavez Ravine. The Dodgers were 3 for 13 with runners in scoring position, which included a two-run single from Alex Verdugo in the bottom of the first, and a solo home run from Joc Pederson in the second. Max Muncy singled in a run in the third and Chris Taylor singled home two in the same frame as well. The Dodgers were up 6-0 after three innings and never looked back after that. Verdugo added a home run of his own in the fifth as the Dodgers have now homered in 29 consecutive home games dating back to August 2018. Cody Bellinger continued his assault on National League pitching. The right fielder was 1 for 2 with two runs scored and three walks. He’s batting .424 and OPSing over 1.400 on the season. Chris Taylor had a great game, as he was 2 for 4 with two runs batted in and Verdugo was 2 for 4 with three runs drive in including a home run of his own as well. The Dodgers battered familiar nemesis Jhoulys Chacin for six earned runs on six hits over 2.1 innings. As for Stripling, as I mentioned above he was fantastic. The Dodger pitching staff has been torched and the Dodgers badly needed some length. Before the game the Dodgers called up rookie Josh Sborz and optioned Dennis Santana back to Oklahoma City in order to give the staff a fresh arm. He wasn’t needed as Strip allowed just one earned run on four hits and struck out three across his eight innings of work. Stripling walked one and made 88 pitches. 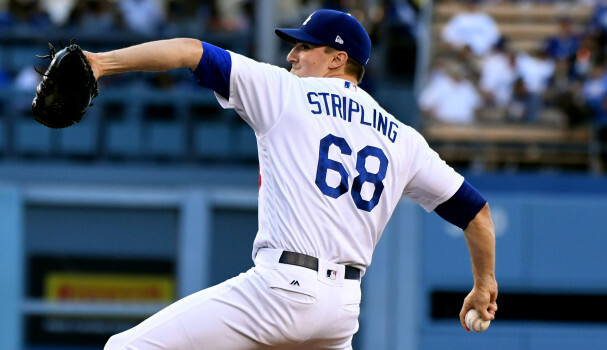 I don’t think we could appreciate what Stripling did enough. Thank you so much Ross! After Strip exited the game, reliever Jaime Schultz pitched a scoreless top of the ninth to secure the win. This is the first time in 2019 that the Dodger’s pitching staff has allowed less than 4 runs in a game. Good to see the staff notch a win. 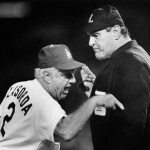 The Dodgers will stay home and welcome the Cincinnati Reds into town for a three game series. That means a slew of ex-Dodgers will return to Dodger Stadium, including Yasiel Puig, Matt Kemp, and Scott Schebler. Puig is likely to miss the first game of the series as he is serving his two-game suspension for last Sunday’s benches clearing brawl against Pittsburgh. Clayton Kershaw will also return to make his season debut. The Reds will counter with Luis Castillo. To make things even more interesting, Monday is Jackie Robinson Day. First pitch is scheduled for 7:10 PM PST. Win one for Jackie boys! Stripling was in total command today. Strips attacked and got ahead of most batters. Plenty of offensive support provided by the young Dodger bats, which made Stripling’s job easier. Shultz was impressive, as he slammed the door. Another series sweep would have been devastating. Can’t wait for the matchup…. Puig vs. Kershaw. Considering they’re down THREE starting pitchers, I think our ragtag bull pen has been doing alright. Schultz and Santana were nice surprises. Kelly is gaining his sea legs, and Urias and Ferguson will be solid relief pitchers once the weight of starting and a lackluster offense are off their shoulders. I can’t believe how much our bats went missing for six games. My comment is I think we should keep Pederson in all the time and Bellinger should remain on first base where he can finally receive the Golden Glove he seserves. Verdugo and he are a potent combo on the right. As much as it pains me, I think we need to put Taylor back in minors to figure out his swing and stop designing the line-up around Muncie. Chicken Strip got the job done. No Puig on JR’s day. But Peraza, Schebler, Kemp, and Farmer make the match-ups interesting. Cody Bellinger proved that he should be at 1st base every game with that stellar defensive effort. He get’s to balls that Muncy cannot even sniff, Muncy’s lack of range cost them a couple of runs the other night in a close game. I know what you are going to say Badger and I vehemently disagree. I think they need that kind of defense at that spot. Verdugo is more than capable to play RF. Muncy plays when Belli needs a blow…which would be never….